Before you rush out to get the cable, though, consider whether you really need it. Instead of connecting the camera directly to your computer for picture transfer, you can use a memory card reader. As for printing, many printers have built-in card readers, so you may not need the cable to enjoy that function, either. In addition, only printers that offer a technology called PictBridge support direct printing from the camera via a USB connection. HDMI port: You can use this port to connect your camera to a high-definition TV, but again, you need to buy the required cable. Look for a Type C mini-pin HDMI cable. 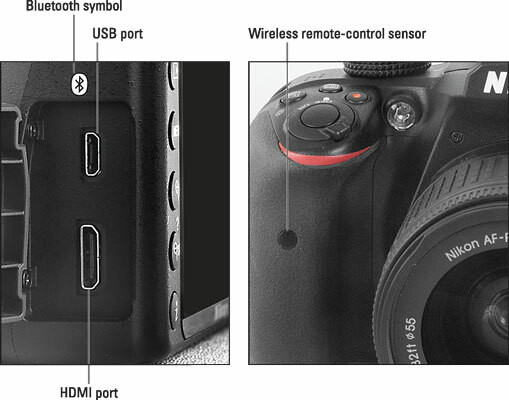 Look on the left side of the camera for USB and HDMI ports; the wireless remote-control sensor is on the front of the camera. Wireless remote control: Although the D3400 doesn’t work with a wired remote shutter-release cable, you can use the Nikon ML-L3 wireless remote. The camera has a single sensor for picking up the remote signal; the sensor is on the front of the camera, as shown on the right side. AC adapter: If you regularly use your camera for extended periods, you may want to invest in an AC adapter, which enables you to power the camera via AC electrical power rather than the supplied battery. You need two components to make this work: the EP-5a power connector and the EH-5b AC adapter. The power connector goes into the battery compartment on the camera; the AC adapter plugs into the connector. The supply connector runs about $50; the AC adapter, about $120. Another option, of course, is to simply buy a spare battery (part EN-EL14a), which sells for about $60. As for the Bluetooth symbol printed above the port cover door, it’s just there to remind you that the camera can connect via Bluetooth wireless technology to compatible smart devices. This feature requires that you install a Nikon app, SnapBridge, on your device. The app is available only for certain versions of Android and Apple iOS operating systems.